Please note that we do not recommend that you use Outlook Express for security reasons. The SSL/TLS encryption used by Outlook Express is now considered as insecure and is incompatible with our servers. We therefore recommend that you update your software rather than use this. If you wish to follow our instructions below for non-encrypted email, please do not use this software with any public WiFi connection. 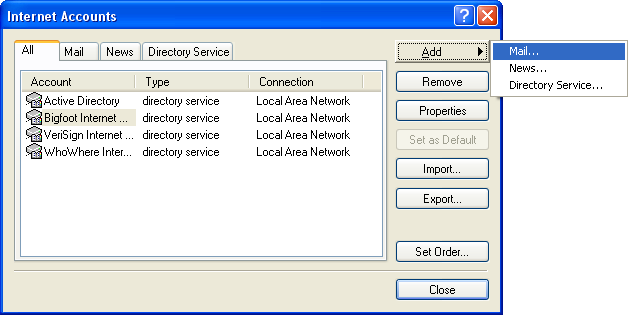 From the top menu, click the Tools option followed by Accounts. You should now click the Add button followed by Mail. You should now enter the display name which is used to describe yourself or your business when others receive your email. In our example, we have chosen to use the business name of "The Domain Name Company". You could enter your own name here if you wanted to. Now enter the email address you wish to use for sending email. In our example, we've used bob@domain-name-here.co.uk. You could choose an address such as info@domain-name-here.co.uk here if you've set up a forwarder. 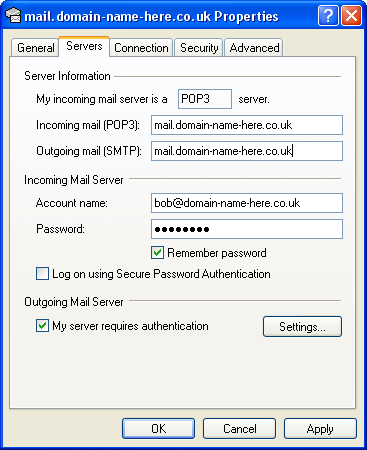 Ideally, the incoming (POP3) mail server should be set to mail.<YOUR-SITE-NAME> as per your setup instructions. Alternatively, if you're in the process of moving from a different provider to ourselves, you may wish to set this to our server's address such as haldir.visn.co.uk (for example). The correct address to use will be within your setup instructions. 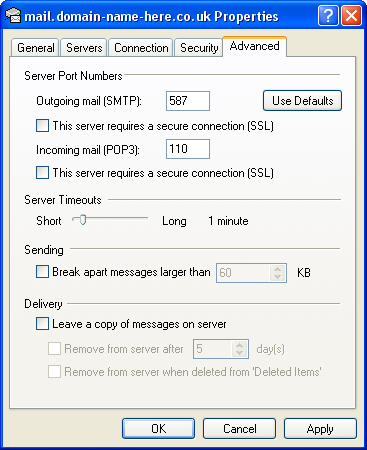 The outgoing (SMTP) address should be set as per your ISP's instructions. The reason for this is that you are already authenticated on your ISP's network so email sent via your ISP should be faster. 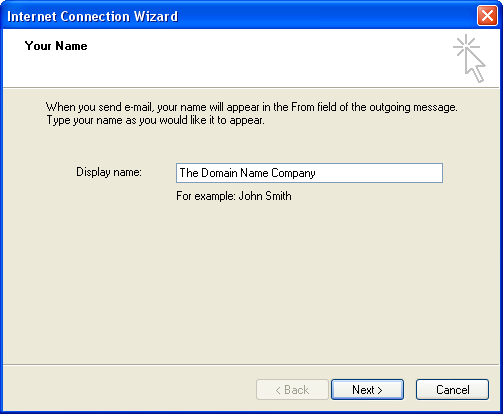 If you don't know the SMTP address for your ISP or your ISP doesn't allow you to send email using your own domain name, please enter the same setting for Outgoing mail (SMTP) as your Incoming mail (POP3) server. 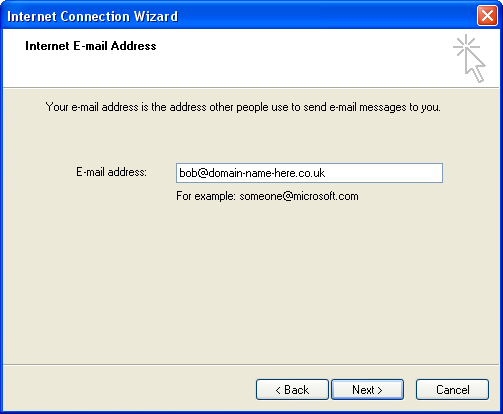 For the account name, enter the email account you've set up earlier in the control panel. In our example, this is bob@domain-name-here.co.uk. This does not mean that only emails sent to bob@domain-name-here.co.uk can be received. As pointed out earlier, you can set up a forwarder so that mail from other addresses can also be received. The account name here is purely to access the mail waiting in that mailbox. 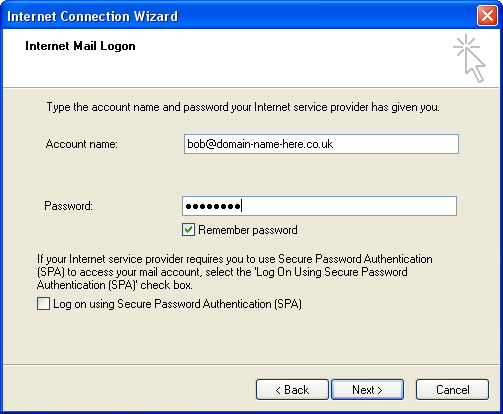 Enter the password you created for the mail account you've set up. Now click Next followed by Finish. 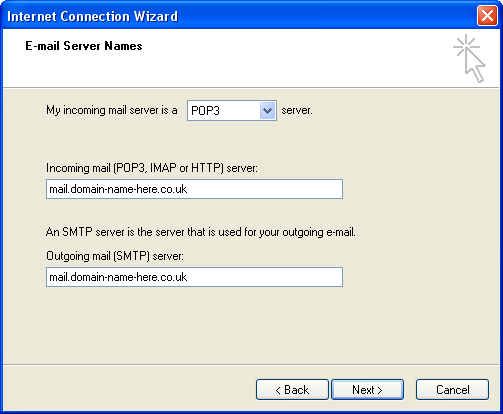 If your outgoing mail server is the same as your incoming mail server, you must now click the properties button for the email account you have just set up. Click the servers tab and make sure there is a tick in the box marked "My server requires authentication". If this is not done, you will not be able to send emails beyond our network. We also recommend in this particular case that you change the outgoing port in the advanced settings from 25 to 225 (or 587) to avoid your ISP blocking you from sending via ourselves. None of these settings should be ticked. Important: It is not possible to have a secure connection to our servers using Outlook Express and because of this, we do not recommend that you use this software.